Dysplastic nevi are described as lesions that are on the continuum between common acquired nevi and melanoma. That is because dysplastic nevi have morphological and biological features that are intermediate between these two entities. A nevus is a condition which is characterized by an increased number (hyperplasia), as well as neoplasia of melanocytes. The potential of malignant transformation of an atypical nevus is higher compared to a benign one. 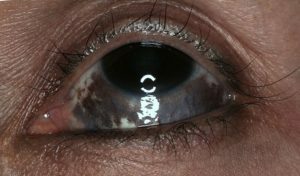 Benign nevi occur in the early period of life, last until adulthood and then disappear. CDKN2A mutation is shown as the risk factor for the occurrence of atypical nevi in families. The whites have an increased prevalence of the atypical nevus. There is also variation seen in the size of the nevus based on their location. The other factor which is seen as a variation in the occurrence of a type of nevus is the race of the individual. Between the sexes, there is a difference seen the location of occurrence of nevi with limb predominance in females and trunk predominance in males. There also occur higher numbers of nevi in males than in females. There even occur differences in the occurrence of the pattern of nevus based on the skin type of the individual. For the acquired nevus, the instigating factor in the destruction and the development of the acquired nevus is the exposure to sunlight, especially the ultraviolet rays of the sun. However, there are also studies against this hypothesis. The germline mutation of the gene CDKN2A is identified to be one of the factors responsible for the families with a nevus. The other factors which have been identified include the BRAF, which is a transductor component in communicating the information. This BRAF has been described as the causative factor in both acquired as well as congenital nevus formation. The UV rays are described to have their mechanistic property of causing nevus due to the damage induced to the BRAF gene. The mutations which are not present in birth and are obtained due to the external environmental stress are known as somatic mutation. Based on the presence of nevus in birth or the occurrence later in life, a nevus can be classified into congenital or acquired nevus. Based on the melanin, it may be in turn classified as increased or decreased. The melanin is responsible for the pigmentary color of the skin. 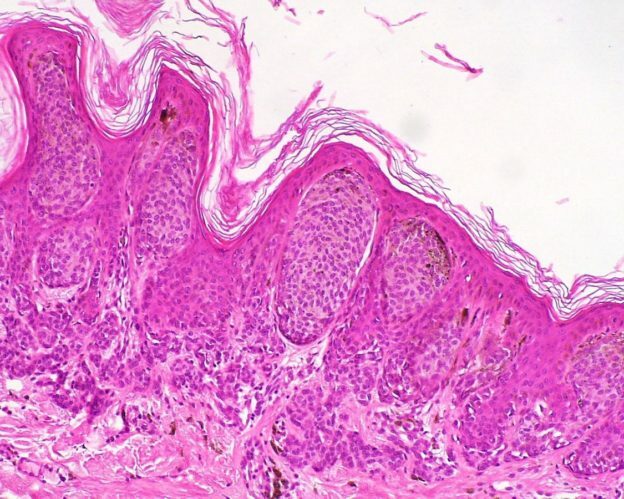 Based on the location of the melanocytes in the two layers of the skin (namely the epidermis and dermis), the acquired melanocytic nevus can be classified into junctional (at the epidermis), intradermal (inside the dermis) or compound (both epidermis and dermis). The other types include beckers blue, hori, and spitz nevus. All the above types constitute the increased melanin variant of the nevus. The nevus which is present from birth is characterized as congenital melanocytic nevus which, in turn, can be classified based on the size of the nevus. The types, in turn, are the nevus of ito and nevus of ota. Both the above types constitute the increased melanin type of nevus. The acquired and the congenital type can also include the decreased melanin variety, and this includes nevus depigmentosus and nevus anemicus. The nevus can also arise from the connective tissue and the vascular tissue of the skin. The nevus, hence formed, constitutes the connective tissue nevus and the vascular nevus respectively. The vascular nevus consists of predominant blood vessels, mainly the capillaries. The benign nevi have a smooth border and an even pigmentation. Regular borders along with multiple colors and asymmetrical shape. The diameter of the nevus is generally greater than 5 millimeters. The lesions, as such, are large and, on histology, show dysplastic characteristics. The nevus can occur in any area of the body but, in particular, in the sun-exposed areas such as the face, neck and arm. The counts of the nevus in the lesser sun-exposed areas such as the back, thighs and chest are relatively less when compared to the face, neck and arm. The nevi which appear with atypical cytology in specific places namely breast, genital and scalp should be skeptically excluded as atypical nevus as there appears an increased risk of malignant melanoma in these lesions. The nevus can be both hyperpigmented (hypermelanotic) as well as hypopigmented (hypomelanotic) in nature. 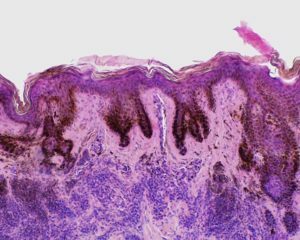 The atypical nevus on histological examination demonstrates inflammation along with fibrosis in variable amounts. Verge of the dermoepidermal junction (junction nevus). In the case of junctional nevus, the continuity of the rete ridges which form a demarcation of the epidermal and dermal is not broken and this forms an important part in the diagnosis of this condition. The combination of both (compound nevus). Although the histopathology examination is not warranted in all cases, some of the cases in which the size is rapidly increasing or there are atypical features, then the histopathological examination needs to be done after a biopsy. This will help in differentiating between the simple nevus, dysplastic nevus, benign melanoma and malignant. Modern day dermatology also employs electron microscopy and immunohistochemistry in the diagnosis of exclusion. The immunohistochemistry which are used for the staining includes S100, A103 and MITF. All of them stain both the dermal and the epidermal component. The staining pattern of the HMB-45 is in unison with the pattern found in the benign nevus of acquired variety. There occur dark brown patches in the skin, and it is related to the exposure to sunlight. There occur dark brown patches on the skin, but it is not related to the exposure to sunlight nor with any other conditions. The seborrheic gland is responsible for the secretion of the sebum of the skin. The keratosis is the thickening which occurs due to the granulomatous proliferation. These represent a tumor involving the nerve tract of the body. There occurs coffee-with-milk kind of marks of the flat and pigmented type. These pigments are associated with syndromes, such as neurofibromatosis 1. The treatment involves laser removal of the café-au-lait macule. This occurs in the mucosal layer rather than the skin, and is differentiated based on the location. An aggressive tumor involving the basal cells of the skin and it will be readily differentiated by the biopsy. This complication, although rare, is a dreadful occurrence. The treatment requires complete surgical excision at the initial stage itself. This is the malignant carcinoma involving the melanocytes of the skin. There occurs ulceration on the clinical examination, along with the change in the texture of the skin. The benign nevus is generally limited within the capsule of the nevus and the presence of the nevus in the lymphatic system is an indicating factor for the probability of malignant melanoma. This requires aggressive excision by means of surgery. 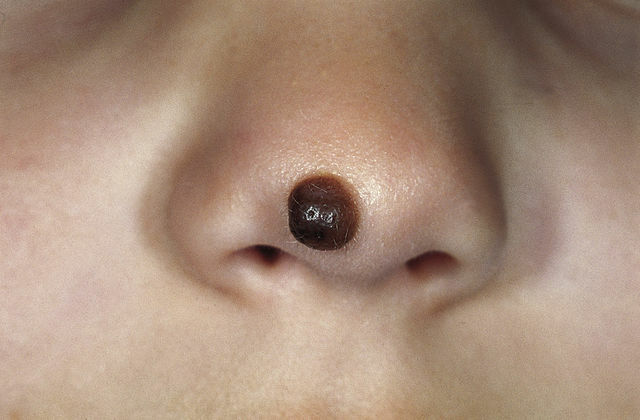 There occurs a congenital birthmark on the child and irregular in shape. This is also known as a mongolian spot. It occurs due to the defect in the migration of the melanocyte from the neural crest to the epidermis. The melanocyte has its origin from the neural crest and then migrates to the epidermis. When the accumulation occurs in the dermis, then this condition occurs. Increase in size (thus posing a risk to malignancy). The occurrence of active ulceration and infection of the nevus. The occurrence of the pruritic itching on the nevus site. Changing to atypical lesion (thus posing a greater potential to malignancy). In the majority of benign nevus without any of the above-mentioned features, the routine management is an observation of the nevus. In patients requiring the management of the nevus, the treatment can, in turn, be divided into medical or surgical treatment. Destruction using extremely low temperatures (cryotherapy). Ablation using the laser beam. Chemical peeling: This involves peeling of the outermost layer of the skin and thereby inducing the injury in the skin. This abraded area is then smoothened by the generation of the new skin. The chemicals which are used for the purpose of peeling include retinoic acid peel, beta hydroxy acid peels and alpha hydroxy acid peel. The side effects of these peels include rashes, dryness and skin irritation. The retinoic acid peel is a deeper and stronger variety of peel of the beta hydroxy acid chemical. The dermal link between the keratinocytes which form tight junctions is opened up by means of using the Jessner peel; so, before applying the retinoic acid dermal peel, the application of the Jessner peel will increase the penetrating capacity of the retinoic acid. The surgical treatment consists of the excision of the nevus of the patient and then suturing back the area. The atypical nevi have the particularly increased risk of transforming to malignant melanoma but, as such, the lesions are benign. The risk ranges with almost a 20% increased risk of occurrence of the malignant melanoma when compared to that of the normal population. In the case of doubtful cases with features representing malignancy both clinically or on biopsy, it is recommended to remove the nevus by surgery to avoid complications in the future.